Massive thickening over a large area of the casting inside or outside, sometimes also at edges, often in association with roughness. Figure 1 is a schematic illustration of the changes to the mold cavity which are basically possible. The effect of heat (radiation, thermal conduction) from the inflowing metal causes the thermal expansion of the mold material. Different temperatures in each mold zone cause considerable differences in tension which affect the surface layers of the mold and mold walls, respectively. The deformability of the mold wall (mold material) and the adhesion to the subsurface (wet tensile strength) counteract the pressure tensions. 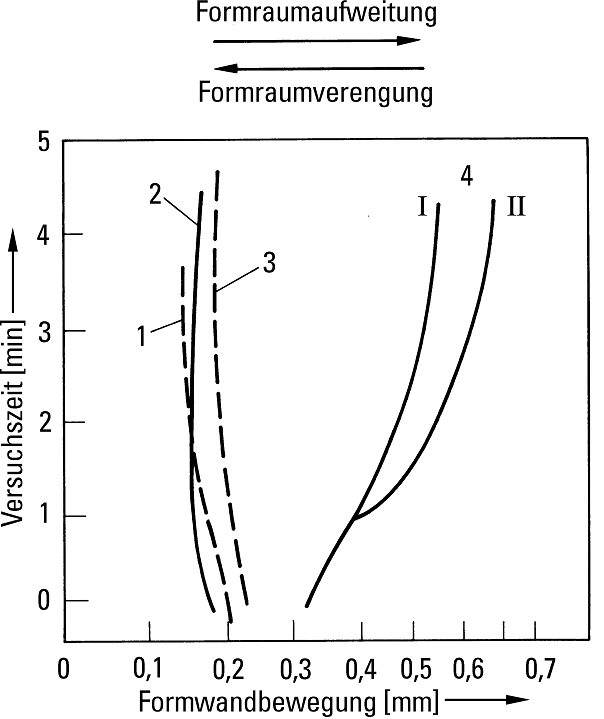 If the mechanical-thermal stresses (tensions) exceed the deformability and strength in the strain cross-section, defects may occur on the casting (s. a. Schülpe, Blattrippen). The dimensional accuracy of castings is determined by various technical-technological influential factors whereas the mold wall deformations under the effect of metallostatic pressure and, in case of cast iron, under the effect of crystallization pressure may cause considerable changes to the dimensions of the casting. The pressure tensions coming along with casting are high enough for wet casting molds to deform the compacted mold material and cause the additional compaction of the mold which always depends on initial compaction and its consistency as well as on the geometrical shape und thus cab never be consistent. Counteracting forces in addition to the resistance of the mold include the atmospheric pressure or the outside gas pressure. The degree of mold expansion is determined by the basic mold material as well as by mold material additives, by compaction and finally by the properties of heated bridging bonds which bond the sand grains to form a mold. If it is possible for the bridging bonds to yield under the influence of considerable quartz expansion, the expansion of each sand grain is transferred to the total structure only to a minor extent. Mold expansion is low. If this is not possible, or if the sand grains even contribute to the expansion process, drastic overall expansion is caused including any possible affects on the casting. The mold cavity changes its dimensions as long as the pressure tensions increase thus causing additional compaction. The metal follows this deformation until a stable marginal shell is formed (figure 2).